In the UK the Cowbird refers to the yellow WAGTAIL, but in North America the name applied to two very distinct birds. The first of these is the Yellow billed cuckoo (Coccyzus americanus), an attractive little bird around 26 to 31 cm in length. The lower part of its gently curved beak is a yellow color, giving this bird its name, with black coloration on the upper parts of the beak Its plumage is grayish brown on top, with white underparts. It has a long dark tail with white spots on the tail's underside. 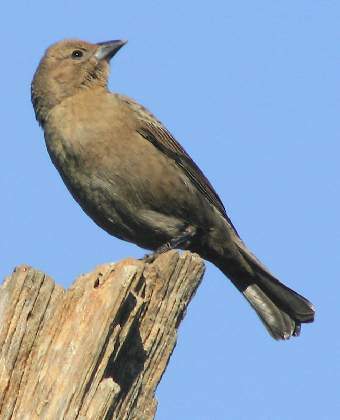 The second and far more common usage of the name Cowbird in the USA is for birds of the genus Molothrus. These are not cuckoos but are part of the icteridae family (cuckoos, on the other, hand being the cuculidae family). However, they share one particularly interesting habit with many of the cuckoos - the females of the Moluthrus genus lay their eggs in other birds' nests for an apdoptive parent to incubate and raise. This habit was first recorded in 1810 by Alexander Wilson (Amer. Orn. ii. pp. 145-160), though, as he was careful to say, they had "long been known to people of observation resident in the country", and indeed he cites an instructive series of observations by Dr. Potter of Baltimore; showing that that gentleman had for some time made the bird his study. The species who are the victims of the Cow-bird's intruding its eggs into their nests are hardly less numerous than the dupes of the Cuckoo, and like the cuckoo, the adoptive parent's own progeny are displaced from the nest by some species of cowbird. In a South American species of Molothrus, Mr. W. H. Hudson (Argent. Ornithol. i, pages 72-97) observed that the old Cowbirds, both male and female, destroy many of the eggs in the nests which they visit. The name Cowbird is an abbreviation of Cowpen-bird according to Catesby (N. H. Carolina, i. p. 34), who says:-"They delight much to feed in the pens of cattle, which has given them their name" These birds are also spoken of as Cow-Blackbird, Cow-Bunting, and Cow-Troopial. The word Moluthrus was originally a misprinting of Molobrus. Although Swainson (Faun. Bor.-Am. ii, p. 277) was at the pains to explain this meaning of it, "qui non vocatus alienas aedes intrat", showing that Molobrus must have been intended, the majority of ornithologists preferred to follow the error. Thus the name of the genus continues even now in the 21st Century to be known as Molthrus.